Russia put three message relay spacecraft into orbit Thursday aboard a Rockot launcher, continuing the deployment of a fleet of civil communications satellites for the Russian government. The trio of Gonets satellites launched from the Plesetsk Cosmodrome at 1243 GMT (8:43 a.m. EDT) Thursday. The 95-foot-tall Rockot launcher lifted off from Complex 133 at the military-run Plesetsk space base about 500 miles north of Moscow, where launch occurred at 4:43 p.m. local time. The Rockot's two core stages, decommissioned components of a Russian ballistic missile, completed their jobs in the first five minutes of the flight. A Breeze KM upper stage supplied by Khrunichev ignited its engine two times to put the three spacecraft into orbit about 1,400 kilometers, or 932 miles, above Earth at an inclination of 82.5 degrees. The Gonets satellites deployed from the Breeze KM upper stage at 1428 GMT (10:28 a.m. EDT), according to Russian news reports. Khrunichev announced the payloads were delivered to their target orbit. Thursday's launch was the 21st flight of a Rockot launch vehicle and Breeze KM upper stage since 2000. Each of the 617-pound Gonets M satellites was built by ISS Reshetnev, which announced the spacecraft were functioning normally in orbit. The payloads launched Thursday are designated Gonets M satellites No. 18, No. 19 and No. 20. The Gonets system is commissioned by Roscosmos, the Russian Federal Space Agency. "Ground controllers at the mission control center located in Zheleznogorsk confirm that the satellites are in good health and their mechanical subsystems have deployed normally," ISS Reshetnev said in a press release. 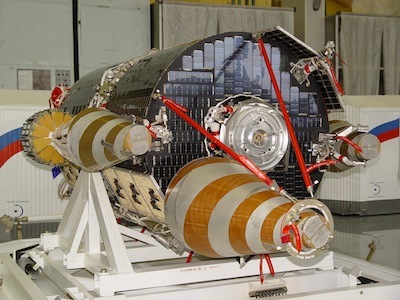 "[The] Gonets M satellites have successfully completed Earth- and sun-acquisition phases." The satellites provide communications in remote regions, disaster zones, and assist users in monitoring industrial and research assets, according to ISS Reshetnev said. The personal communications messages relayed by the Gonets system are beamed up to a satellite while it is in view of a ground transmitter, then stored in the craft's on-board memory until the satellite passes over the message's recipient. Gonets means "messenger" in Russian. With the trio of satellites launched Thursday, the Gonets fleet now includes 10 satellites, according to Roscosmos. The fully operational constellation needs 12 satellites, a capability Russian officials say will be achieved next year.